Disclaimer: I rec’d a review copy of this book from the publisher as part of their review program, Blogging for Books. 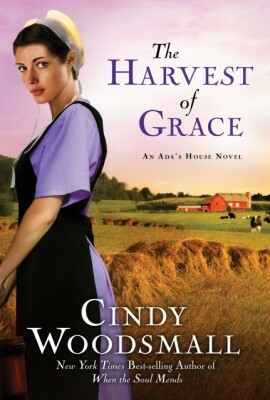 I rec’d no other compensation and the following review is my honest reaction to The Harvest of Graceby Cindy Woodsmall. Here’s a nice, easy read after all the heavy tomes of late: The Harvest of Grace by Cindy Woodsmall is a quick read filled with insights, information about Old Order Amish, and a well-written narrative. As far as Christian chick-lit — this is one of the best. The Harvest of Grace is the third part of the “Ada House” series. Starting a trilogy on the third book is not usually a good idea .. but since I was offered a review copy of The Harvest of Grace, I figured I’d give it a shot since the story sounded interesting. Whether or not you’ve read the other two, the author helps with a brief synopsis of the previous two books — so the reader knows enough of what had happened to delve deeply into the lives of the Old Order Amish in a small town in Pennsylania. The story follows two plot lines. The first plot-line is about an eldest daughter in an Old Order Amish family of nine daughters, 26 yo Sylvia Fisher. Sylvia has not confirmed her full acceptance of the Amish faith and is fighting within herself, searching for a chance to be a decision maker on her father’s dairy farm while seeking a like-minded husband. She is the hard-working farmhand on her father’s successful dairy farm. When she is betrayed by a man whom she thought she loved, she sets off to be the farm-hand for an in-trouble dairy farm owned by another Old Order family some 30 miles from home. Sylvia is fighting against the woman’s place in an Amish family, against her betrayal and the people who hurt her, but mostly, Sylvia is fighting against her own failings. The second plotline deals with Aaron Blank — a recovering alcoholic who is the only child of an Old Order Amish family. He doesn’t like farming … considers it a nothing going nowhere … but knows that he needs to help his parents. He would like to take care of his parents by selling the family dairy farm, moving his parents into town, and buying/running an appliance store geared to the Amish and Mennonite communities. Aaron is railing against his father, his past, and his addictions. But mostly, Aaron is fighting his inability to forgive himself for his past mistakes, including blaming himself for his sister’s death. This book tells the story of forgiveness — forgiveness towards others, towards God, and most importantly, towards self. The book deals with Aaron and Sylvia and their relationship … and that of their nearby neighbors. The story revolves around forgiveness, repentance and restitution for past wrongs, and acceptance of the failings of others. The book has a strong Christian element of God’s providence and hope for the future. I also liked that Woodsmall shows the great difference between lust and love — and how basing relationships only on lust never works. Woodsmall shows that we can only change ourselves through asking for God’s help. We can’t change anyone else but rather, all we can do is accept them, forgive them, love them. This book is a wonderfully written, loving portrayal of Old Order Amish ways — ways which are so foreign to our secular world, ways that have so much to teach/help our world today. I highly recommend this light, chick-lit read for a slow afternoon/evening read.